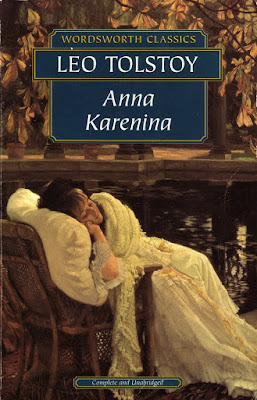 I spent a little over a month reading Anna Karenina, hoping and praying for the book not to end. It was my first Tolstoy, and I have to say, one of the best reading experiences of my life. Tolstoy is known, according to that little book analysis at the beginning of my edition (I can't seem to remember who has written it) for his ability to make fiction seem real, and the characters do almost walk right off the pages. I am certain, that Anna Karenina is one of the best works of literary realism. Someone asked me a while ago what the book was about, and my reply, "A love affair and the social and personal disasters it leads to" just didn't seem to cut it. It is a book about an entire Society, I would now say. Religion, politics, marriage, happiness, insecurity, death, aristocracy, social obligation and everything in between. I used to think it was beautiful and amazing how writers can come up with a whole new world, a bizarre, fantastic world; which is why fantasy was my favourite genre. I think now, that it is much harder to come up with a world that so closely resembles real life. To write an (almost) nine hundred pages-long story, with not just a single one-directional plot, but a combination of the lives and concerns of about fifty characters, strung together by the fact that they live in the same society. Tolstoy managed to keep me engaged the entire time, because it was not just a world entirely new to me, but a world that might just have been real once upon a time. Fascinating. The writing had an amazing flow to it, and I would like to believe that little was lost in translation. The book was a page-turner, but not in the sense that I wanted to find out how it ends, but because I wanted to find out just what happens next. I loved that the book wasn't only about the charming Anna Karenina and her tragic love affair with Count Vronsky. What wonderfully contrasted the story of Anna Karenina, was that of Konstantin Levin, (possibly my favourite character) the socially inept landowner, who is more or less a representation of every individual's search for some substantial meaning of life. Ultimately, the one thing that hit me the most about the book, is what Tolstoy has to say about family. It is a book about different people, their lives intersecting by a matter of chance, coping with their everyday problems, while their fates are decided by the already defined society. Tolstoy's ability to describe even the littlest of things in a way that you feel you're actually there is commendable. You realize so much about the characters just from the way they move, sit, talk. Throughout the book, Tolstoy has described things from the outward social view as well as given you a glimpse into the characters' minds, their thoughts, opinions, their seemingly unpredictable decisions. You also see, and this was the one thing I really appreciated, the different characters from each other's viewpoints. I think that gives the most insight into the way people think, the quick judgments we make, the small insecurities, envy, jealousy, anger. I was really amazed at how precisely the author has displayed the emotions flowing through a person at every stage, how well he has shown arguments and fights and little bursts of anger. The story gave me so much to think about; I have been chewing my brain on the contents of this book since last night (when I finally finished reading it.) In all probability, I have yet to grasp many aspects of the book. Some things might strike me later, or when I read the book all over again. But there's one thing I am entirely sure of at this moment, (and it isn't just the post-reading excitement talking) this is the most amazing book I have ever read and I would love to re-read and re-experience it! Reading classics is a daunting task. I had read abridged Malayalam translations of Anna Karenina and War and Peace sometime back. Your post makes me want to read them again in English this time. Have you tried reading Fathers and Sons? Its one of my favorite Russian novels along with Crime And Punishment. Wonderful review! I have this on my TBR shelf and I'm hoping to get to it soon. I am so glad you enjoyed it! I read it this year as well and fell in love with it all. There really is just so much going on, but it is all so engaging! I am now looking forward to reading more by Tolstoy and really other Russian authors...as well as reading this again! I read this last year and I love love LOVED it! Great review, and I love that you loved it too! Thanks! It's a long book, so I would suggest you read it along with your regular short reads, it's what I did. Thanks for stopping by! Thanks. I really did LOVE it :D ! Glad you stopped by! Glad you loved it. Read it in high school with a friend, and we both couldn't get enough! Goes on my all-time favorites list, for sure. My sister has warned me that the writing in both the books is very similar, which is why I am going to postpone reading War and Peace indefinitely. I am switching to shorter works by Tolstoy though, starting with The Death of Ivan Ilyich, which will arrive at my doorstep any day now :) Glad you stopped by! It is so nice when someone puts the same thoughts that you have about a certain book that you enjoyed, in the proper words. PS Of course, this is a compliment. I read Madame Bovary for the same challenge, and the introduction kept talking of Anna Karenina. I have wanted to read this for a long time, but I think I have read enough for a month, at least, of affairs and how they lead to one's downfall! Plus, with Dead Souls and The Idiot on my list, I think I should not try any more Russian writers for now! Then I guess I want to read Madam Bovary as well now. I didn't get around to reading Crime and Punishment, because my sister had lent out our copy and the horrible person never gave it back. As soon as I find it in my library, I'm going to read it!